Isn’t it weird for someone to work at a place where they’ve never experienced their company’s product? How do you know how to market something you’ve never experienced firsthand? It is really hard! People can tell you about it, and explain everything there is to know, but until you’ve experienced it yourself, you never truly understand. 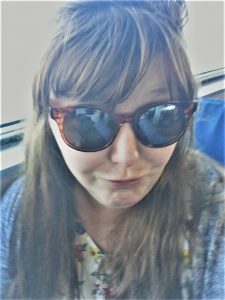 I had never been on a ferry, never been to Nantucket, and not being from the Cape, let alone New England, I didn’t really think that was a big deal. That was until I started working here, and then it just needed to change! So, Betsy and I went over on Grey Lady IV to meet the Nantucket Hy-Line employees, as well as explore downtown and introduce me to the island. Let me tell you, I fell in LOVE! As soon as we walked off the boat, I felt this immense feeling of calm wash over me. I know that sounds weird, but I really did. The sky was so blue, the weather was a perfect 70, and I couldn’t be anything but content. 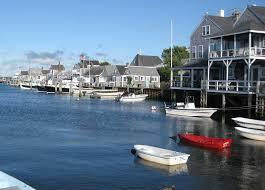 You really do feel transported to a completely different place when you’re on Nantucket. Yes, technically I was still working, but all my cares and worries just drifted away as I walked down Straight Wharf, where we dock, peeking into shops as Betsy told me all her favorite spots. We visited a few key spots while we were on the island, but my favorite by far was Aunt Leah’s Fudge. I was served by Aunt Leah herself, and we got to sample several fudges as well as her chocolate covered cranberries. I just had to buy some for myself, as well as some for my 2 favorite guys, my dad and husband, who are both big chocolate lovers. My favorite was the sea salt chocolate, but there are about 20 flavors total, and anyone can find something they enjoy! We walked down to what Betsy called, “one of the most photographed spots on Nantucket” which is on a side road and has a splendid view. Here is the shot that I got while we were there, I’m sure you’ll recognize it! We also visited the Nantucket Whaling Museum, which was very interesting. As sad as it made me to hear about all the whales who died during this time, it was really cool to see the whale skeleton hanging from the ceiling of the main room and to see how big whales really are, as well as learn a little bit about the history of Nantucket. My favorite part was going all the way to the top of the building where you could overlook the ocean and downtown from a rooftop patio they have set up. Here is a video from the Whaling Museum that will tell you more. The little shops all over downtown are great to look in and explore without feeling too touristy which is great. I just HAD to get these amazing new sunglasses. Duckface selfie anyone? We were both getting hungry, so we ate lunch at The Tavern, the restaurant right at the Hy-Line dock. It was DELICIOUS! I had a crab cake sandwich and fries, and it was the perfect summer lunch to go with our summer day on Nantucket! Sitting outside on the patio watching everyone pass, and feeling the breeze was so relaxing. Overall, Nantucket is definitely somewhere I want to be more often. It is such a relaxing, peaceful place, with a very friendly atmosphere that makes you feel right at home. I loved walking around, enjoying all that downtown had to offer, and cannot wait to go back and explore more of the island!